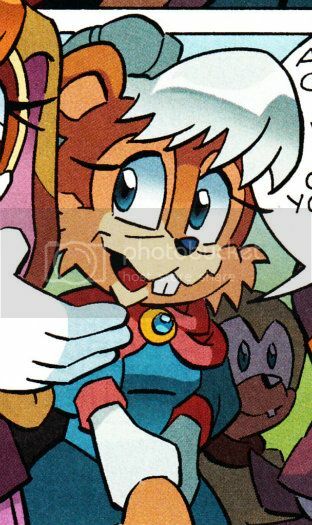 Rosie is a female Mobian woodchuck and the nanny of the Knothole Freedom Fighters when they were younger. Rosie was one of the many who aided in getting refugees out of Mobotropolis and safely to Knothole during Dr. Ivo Robotnik's military coup. Since the demise of Robotnik, Rosie has acted as a nanny and baby sitter for younger Mobians and offered advice to Sonic the Hedgehog and others when they have needed it. Rosie also aided in helping refugees escape from Robo-Robotnik's hordes of Shadowbots when he retook the city of Mobotropolis. Upon arriving in Knothole, Rosie convinced Mina Mongoose to tell a group of young children a story to calm them down.